Christians often talk about seeing the world through God’s eyes, or at least trying to, but what does that really mean? In the past, I’ve mostly thought of God’s sight as a type of telephoto lens, with some built-in x-ray powers. In other words, God zooms in close and focuses on the micro aspects of his creation. Seeing like God means seeing the individual details. But lately, I’ve begun to think God’s sight is just as powerful in its ability to zoom out and see the big picture. (I wrote a bit about that big picture viewpoint in my “God doesn’t use checklists” post.) God’s wide angle lens is so encompassing, that nothing gets cut out of the frame. (Clearly that photo I took, above, was not taken using God’s wide angle lens.) He doesn’t have to make choices about cropping and composition, because everything is in the picture, and he can grasp how it’s all connected and important—it all has a place. Of course, I can’t grasp much of any of this concept. Just watching myself flail around in search of metaphors to help me wrap my human mind around this Godly way of seeing is sort of pitiful. But I do want to “see better.” I think the world would be a better place if we all tried to see a little more like God does, so it’s worth taking the time to give it an awkward, human shot. Luckily, people-watching is my favorite way to pass the time, and there’s no shortage of entertainment when more than 250 14-year-olds are fidgeting and chattering before you. I began by scanning the rows for my daughter’s closest friends—the girls who come to our house, eating our food, leaving their socks around, and sending the sounds of their giggles out from under bedroom doors. Then I widened my scope. There were the kids she went to elementary school with; the ones who are in orchestra with her; the girls on her volleyball team. As the ceremony began, I stopped looking at the kids in terms of focused categories with particular meaning in my life, and I started looking at them as a whole group, made up of individuals. 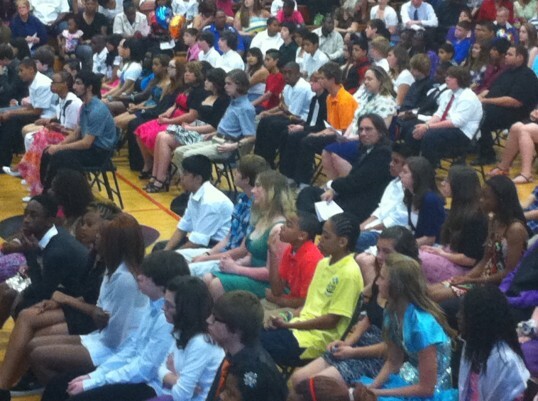 Suddenly it occurred to me, up there in the bleachers: I have a bird’s eye view of every 8th grader in our town. The ones who are spoiled by their parents and the ones who are neglected. The ones who assume college is a part of their future, and the ones who can’t imagine how college could be an option. The ones who speak English at home, and the ones who know English better than anyone in their household. I looked at all of those kids, in all their diversity (our middle school is 44% Caucasian, but ethnic diversity is just one piece of the differences represented), and I was overcome—with fear, concern, compassion, hope. And I thought about how rarely I truly see like this. My life is so shaped by what I know, and so focused on who I know. My frame of vision cuts so much out of the picture, and my point of view filters how I see what’s left in the frame. I’m not sure exactly what to do with that big-picture glimpse I caught, blurry as it was. But I am thankful that my perspective was broadened, and that everything—even my daughter, whose features and expressions I know better than my own—looks a bit different now than it did before. What do you think it means to see the world through God’s eyes? When have you felt like you caught a glimpse of what God sees? I’m having a tough mama time with this one, as my own 14 year old completed 8th grade without any of her friends, with no fanfare at all. The posts forms friends from the school she attended about graduation only broke my heart. I could use a wide angle focus as I wrestle with this child who has confounded, confused, challenged and delighted me. All I see now is a next year filled with second best options and I feel defeated, confused and discouraged that I will ever be able to help her find that exact right spot. I envy your daughter her close friends and her school, and her wise mama. Sorry to be such a downer. Having compassion on another, even when they’re driving like an idiot. I can’t even imagine what it’s like to see how God sees. My two brain cells are struggling just thinking about it. I think they may even be arguing about it right now. Jen, I’m so sorry! It’s really hard to make choices as a mom, always ultimately wanting the best for our kids but not always being able to control all the steps along the way. Your gut is strong and wise, though, and I feel sure you will both emerge in a good place. Peace, sister. cbphoto, ah, yes! I definitely need more of that compassion for others when I’m driving. And I hear you, when it comes to not being able to grasp something like how God sees. I guess the minor epiphany I shared in this post is just one of those small slivers that you can’t fully understand, but you have the sense belongs to something much bigger.